Welcome to District 12: Our interview with Jack Quaid and Dayo Okeniyi at the Midnight Release Party! 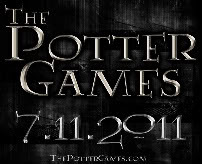 Our interview with Jack Quaid and Dayo Okeniyi at the Midnight Release Party! 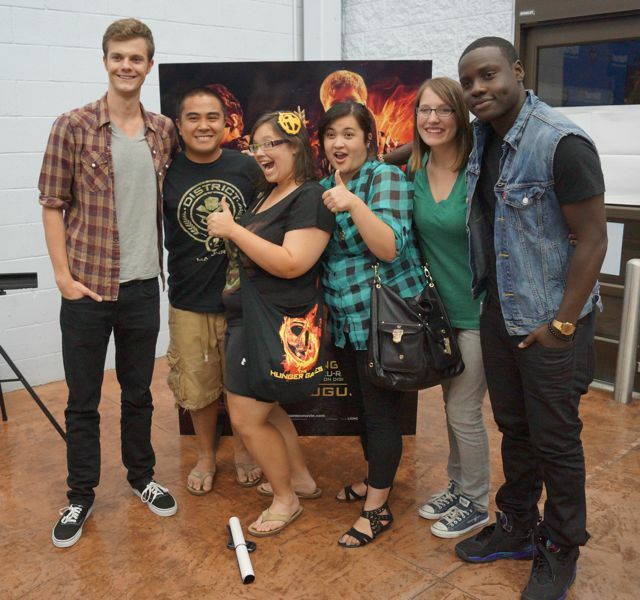 Last Friday night we attended the Santa Clarita Walmart Hunger Games DVD release party! While many fans lined up outside of the Walmart answering trivia questions and eating cupcakes, we (Courtney and Tiffany) got a spectacular opportunity to have a group fansite interview with Jack Quaid (Marvel) and Dayo Okeniyi (Thresh). We hung out with the lovely Erin and Elena from TheHungerGamesMovies.net, Beth from Mockingjay.net, and the ever awesome Aldrin from Down With The Capitol. 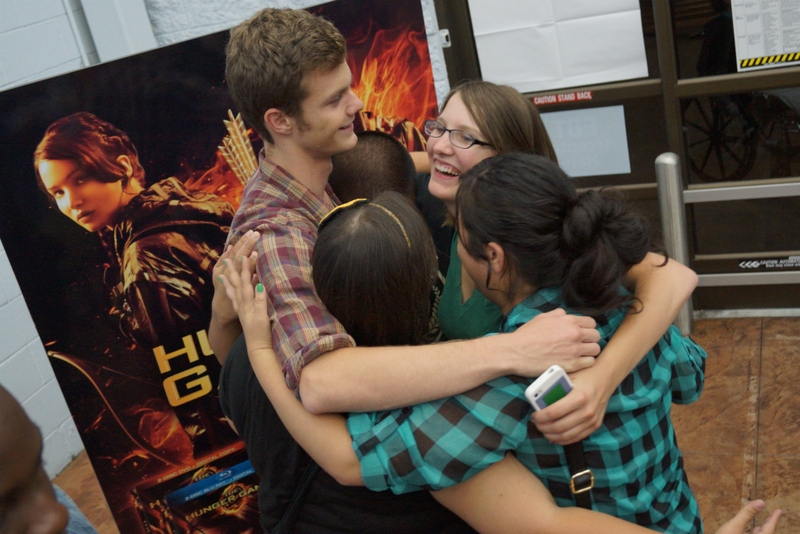 From left to right: Jack Quaid, Aldrin, Courtney, Tiffany, Beth, and Dayo! Fansite group hug with Jack! You guys will definitely want to see Aldrin's Vlog of the night's events, especially our interview with Jack and Dayo. Although we have provided an audio recording and transcription for you guys, you have to see it to believe it. Hilarious conversations were had! 03:54 through 14:11 mark is the group fansite interview! Click below for audio recording and interview transcript! Jack: All right. Lets Go! Question: Ok, so we saw the special features..
Dayo: First of all, hi! Courtney: So, we saw the special features, and there is one part that is hilarious. Jack, he’s like, you guys are all together, and they're like "PUT YOUR COFFEE DOWN!" (everyone laughs). Jack: You guys have seen the special features, we haven’t yet. Jack: You have? (slams table) WHAT? No one I’m always the last, no one knows where I am. Dayo: But you remember it though? Jack: Oh I remember that. Jack: (very animated) PUT YOUR COFFEE DOWN! Courtney: So that’s why, cause you like to drink coffee? Jack: I don’t know, we just kinda felt on set like "Oh yea, people just drink coffee on movie sets, so we should just do that." Dayo: All the adults are doing it dude, we should. Jack: We should just get on this coffee thing we’ve been hearing about. Dayo: Fun Times. What site are you guys from again? Courtney: We've tweeted you guys, we exist. Dayo: We know you guys. Jack: As do we, we also exist. Fantastic. Beth: This is such a silly question, but I promised that I would ask it. Dayo: There is no such thing. Jack: There’s no such thing. Beth: Oh wait til you hear it. Dayo: (laughs) she said wait til you hear it, oh no. Beth: So, why are your dimples so swag? Dayo: First of all the question should be why is your DIMPLE so swag, cause I only have one. So, on the red carpet… where is it again (feels his face)… so I always have to hit it like this you know (best red carpet pose zoolander style)…every pictures gotta be from this angle. But I don’t know man, you gonna have to ask the dude upstairs. Jack: Sweet phone cover by the way (points at Beth’s phone cover, which is a Nintendo phone cover) I’ve been admiring that for like 5 minutes. Beth: Don’t you wish that you could just play Tetris on it? Jack: I want to do it so bad right now. I miss Game Boys. Courtney: I have a segue question. Jack: Oh, thank you for asking this question..oh man, Left For Dead, Team Fortress Two, Halo, Gears of War, all that stuff…its so good. I don’t know. Jack: Red Dead Redemption. I’m gonna call that one right now. Courtney: You know these are all the awesome ones. Jack: Oh yea, what about you? Dayo: That’s the way to go. You know, I am from Nigeria man, you know we don’t play football, we play, we play football, so you know, FIFA all day. Jack: Look, actually I have it, I put it on a bulletin board in my room in my apartment, I just kind of stuck it in the corner. And I felt bad cause then I saw him at the premiere wearing it and I'm like IT COULD BE A FASHION CHOICE, but no it’s just kinda like a little, little remembrance. Dayo: Every time you leave your apartment. Jack: Good times in North Carolina. Aldrin: Question. So I asked this to this girl, her name's Jackie Emerson, I don’t know if you know her. Dayo: She’s one of my..
Aldrin: So I think she was at Costco, but we’re at Wal-Mart, so let’s say Wal-Mart. So you have 10 minutes at Wal-Mart and you can get whatever you want, what would you grab in just 10 minutes? Jack: Well here’s the thing..
Dayo: Ben and Jerry’s Ice Cream would be paramount. Jack: The electric ones. We would go. Cause no one was there that needed them at 2 am. So we would just go around, and I would just collect all the steak that I could find, so I guess that’s what I would still do. Dayo: Cause that’s all we were allowed to eat. Jack: That’s all we were allowed to eat. Just for the sentimental value, I would be like scooter and a steak. Gonna do it. Dayo: They kinda started to get angry with us. Dayo: You boys. (In his best southern accent) You boys need to put them scooters back. Jack: You saying really boys, has like four syllables. Dayo: In North Carolina, boy has like four syllables. Dayo: You boys… You boys need to put them scooters back. Lionsgate: Hey guys can you do a shout out for, well he’ll shoot it, but for well, ABC.. so say, “Hey this is Jack and you’re about to watch The Hunger Games Bluray segment” or something like that. You know whatever you want to say. ABC: You know like the only one in California. Dayo: I’ll do the Dayo part and you do everything else (points at Jack). Jack: Ill do everything else. Dayo: Hi I’m Jack Quaid, and I’m Dayo… and then back to you. Jack: And welcome to the release party. Jack: This is going to take 5 times. Dayo: Ok, lets go. 1,2 ..
Jack: Oh sorry am I not…all right. 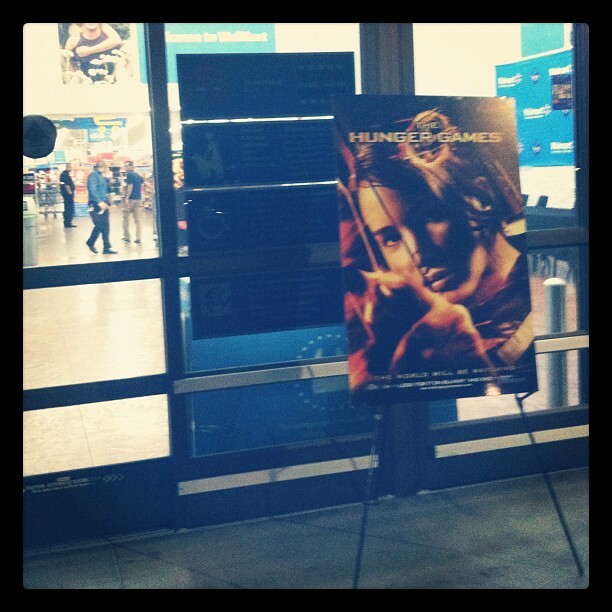 Lionsgate: Just say midnight release party. Jack: You got it, you got it. Jack: And we are at the Midnight Release Party for the Hunger Games DVD and Blu Ray.. Welcome. (Giggling) Lets do it again. Jack: I made it weird at the end. (everyone laughs) I made it weird at the end…just cut the welcome. Dayo: (robotic, does vulcan salute) Midnight Release Party…. Welcome. Jack: (Austin powers voice ) DVD Party! ABC: Ill take as many takes..
Jack: Fine just one more..I can’t even. Dayo: Take two. A little more personable. Jack: And we’re at the midnight release party for The Hunger Games DVD and Blu Ray. Jack: (dramatic) Have a good evening, sir! Courtney: I have a question…from someone on tumblr. What is your opinion on sandwiches? Jack: I’m a huge fan of sandwiches. I had a sandwich today in fact. Which is insane. Dayo: I think they are awesome. Not when you’re not allowed to eat carbs. We weren’t allowed to eat carbs. You see how I am trying to make this about the movie . Jack: There is actually a story I have always wanted to tell. Jack: Yea. So we weren’t allowed to eat carbs at all. And I remember I was in my hotel room late at night, and I just had bread. I just had this thing of bread. I was so tempted, I even had it in my hand, and then right here… and then I swear to God I said out loud, (Jack and Dayo together) "NOT TODAY". (everyone laughs as he motions like he threw it) It was like a bomb or something… just NOT TODAY. It was insane. Dayo: So every time we looked at bread from that day on, we’d be like, (Jack and Dayo together in deep voices) "NOT TODAY". Lisa: What was your favorite restaurant? Where’d you guys always go? Jack: What was that like Whole Foods-esque place? Dayo: Yea. Ooh Godzilla roll! Jack: I basically introduced you and Jackie to sushi. It was like this whole new world for you. Dayo: I’d never eaten sushi in my life. I was like against raw fish. Entirely. Me and Jackie were. And then we had this thing called the Godzilla Roll and ugh and we’ve been hooked ever since. Jack: Whenever we get together now you know it’s always a sushi place or like Umami burger. Dayo: I mean here in LA, the Umami Burger is like - we’re there. Tiffany: I have a segue question. Tiffany: We wrote it down.What is your favorite thing to eat at Umami Burger? Cause I love Umami. Jack: Ahi tuna burger ya. Tiffany: Ooo! I like the cheese tots. Dayo: Ya, those are nice. Jack: I like their ketchup. If I could just drink that ketchup I would be happy. Dayo: The sweet potato fries, with like the sugar on top. Tiffany: Oh, I have never had that! Dayo: It’s good stuff. It’ll change your life. Lisa: Jack, have you figured out your autograph yet? Jack: Yes. I was like OH GOD! Jack: At first my signature was horrible. My driver’s license is the worst thing ever. It’s like Jack Sort of, and then like Q U, and then it looks like someone drew a very crude treasure map. Ugh, but no, I sat down with my roommate and worked out this whole thing. It’s good. But the terrifying moment was when we had this poster we were going to get for Gary, and everyone was going to sign it. And it was my turn and I was like, it has to be good. The pressure was on. Dayo: It’s the one he’s gonna have on his wall. Jack: After that, I was like I gotta it together. Dayo: This is awesome man. I visit all your sites religiously. This is craz.y. Jack: And now the pressures on, gotta see if I can do it. Courtney: Well, you know we watch all the interviews, and you guys have been asked like every single question, and I don’t wanna be lame by asking you a question you've already answered. Jack: You know I am actually surprised that’s the first time I have heard that. Dayo: you know what’s actually the one that I get like every single day.. "Did you read the books?" Beth: It boggles everyone’s mind. Like all the fan site runners, when people ask that to you. Dayo: It’s like are you kidding me. Courtney: No, we didn’t do our research at all. Dayo: I just winged it. Jack: I just showed up man. Did what they told me. I thought I was filming Harry Potter. Dayo: (shocked) This isn’t Harry Potter? Lionsgate: I’m gonna keep watching you and see at what point you just start writing a D period. Jack: We’re D J man. Dayo: Ah Yea. DJ Thravel. Jack: That could actually be a name, DJ Moresh. Dayo: Swaged in, swaged out. Dayo: I don’t know girl, you gonna have to ask Big G Upstairs. He’s the one who made them. 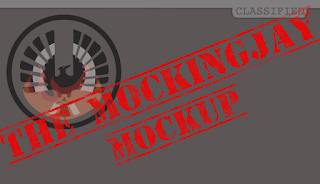 A million thanks to Lionsgate for such a great opportunity, and big thanks to our buddies over at TheHungerGamesMovies.net, Down With The Capitol, and Mockingjay.net! Check out the other fansites posts about the nights events!